Dr. Bodner combines her love of mathematics with her love of geometric art. "Geometric Islamic patterns, especially those consisting predominantly of star polygons, fascinate me," said Bodner, who has been teaching at Monmouth since 1988. 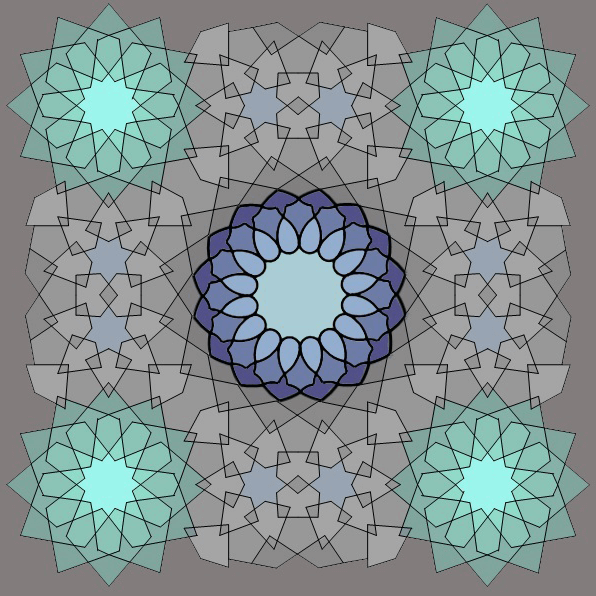 Bodner’s primary interest involves the examination and analysis of the patterns and symmetry evident in geometric Islamic ornamentation found during various time periods and in different regions of the Islamic world. intuitively recognized as being “right” by various Islamic cultures. Bodner also enjoys the challenge of finding plausible Euclidean compass-and-straightedge constructions (which preclude measurements of any kind) of these fascinating geometric patterns. Bodner has also had her artwork displayed at various juried art exhibits. To see some of her pieces, visit the Mathematical Art Galleries website, http://gallery.bridgesmathart.org, which is the online home of the mathematical art exhibits displayed at the annual Bridges Conferences and Joint Mathematics Meetings. Dr. Bodner received a doctorate in Mathematics Education from Rutgers University and has taught approximately two-thirds of the mathematics courses offered at MU. “Among the greatest advantages of taking mathematics courses at Monmouth are the small class size and the active learning environments provided by the professors, who really get to know and care about the students in their classes,” said Bodner.